Through Craigslist, I have purchased/inherited this lovely homemade vermicomposter. It comes from the owner of this blog. 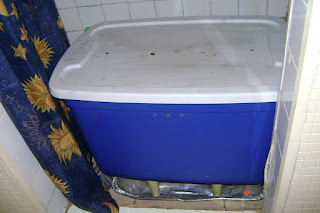 I have mixed feelings on vermicomposting in general. More trouble than it's worth? Especially since corporations are getting into the vermicomposting business on an industrial scale? From speaking to a vermicompost distributor at Canada Blooms, it looks like that's the direction the curbside organics program may be going. But anyway... it's educational for the kids, right? Learn all about worms, their life cycle, what they eat, etc! And this one appears to have been well-designed to assuage my "escape" fears. All the airholes are sensibly patched with screening material. It's only held on with duct tape, but the tape appears pretty solid so far. The only catch is... the bin is FULL. Lots of excellent, rich compost for my garden - as long as I can sit down and sort it out somehow. 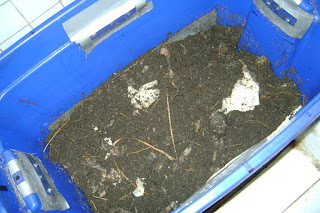 What you see in this picture is about 1/3 of the bin, full of worms swimming happily (for now) in their own end-products. The former owner tried the new-bedding-on-one-side strategy (the worms are supposed to abandon the yucky old stuff and move into the new bedding right away) at one point, but apparently had not as much success as I would have liked with that. But the alternative seems to be dumping it and sorting by hand. OR - some kind of screen? 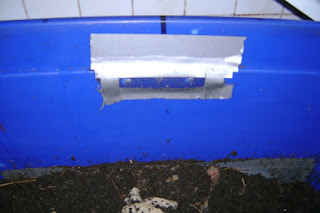 That will retain most of the worms, while allowing the crumbliest bits of compost to run through?? This calls for some big-time Google! Unfortunately, both kids are awake now, and I have done nothing around the house today. So, so tired; last night was another 2 a.m. night fiddling with the computer. This is my first time blogging with Picasa in XP. None of the bazillion annoying popup error messages it's always given me - yay! Still sticks that annoying Picasa logo in at the end, though. I have to go in and manually remove the one it sticks after every single Picasa-based post. Like the one I'm removing right now. Aargh.